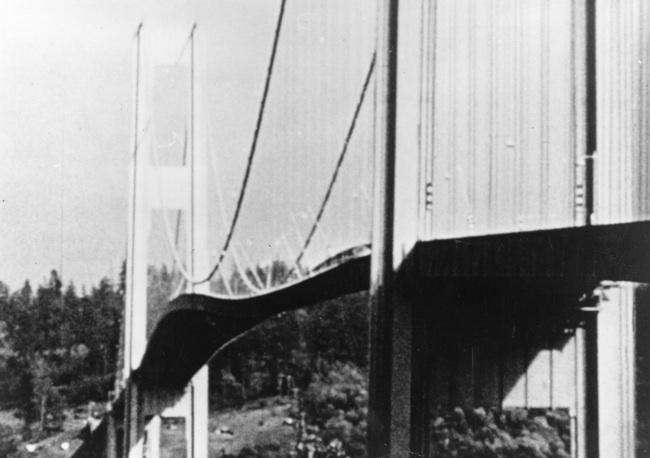 The original Tacoma Narrows Bridge design by Clark Eldridge was pretty conventional for a suspension bridge, but it was later modified by Leon Moisseiff to be slimmer and more elegant. The most notable change was that the 25 foot lattice of stiffening trusses underneath the bridge on the original drawings, were replaced with 8 foot solid steel plate girders. The new solid girder along the side in Moisseiff’s design made for a much lighter and more flexible bridge — it also caught the wind like a sail — but they didn’t know that. Moisseiff’s design was also 2/3 the price of the original Eldridge design and that fact ultimately won the day. I talked to John Marr from the seminal zine Murder Can Be Fun for this story and I’d like to give a shout out to Alan Bellows of Damn Interesting for independently suggesting Galloping Gertie as a show topic and publishing a great, much more detailed account of the disaster on his site. Thanks also to Steve Burrows (from the Pyramids episode) who talked me through the basics of aeroelastic flutter and vortex shedding. Those explanations for the bridge failure were a little too unwieldy for the episode, but I’m glad I now know it! The best laid plans of mice and men, oftimes , go awry.